Birthstones are the stones that have been said to represent each month and the people born in those months. They come in a variety of different gem-types and colors and signify great personality traits and wonderful moments in a person’s life. 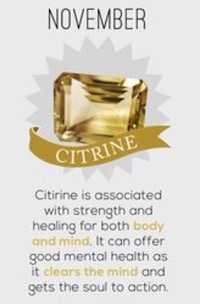 Understanding the nature of birthstones is a great way to gain an insight into yourself or your loved ones. Pick out the birth month of the person who’s birthstone you’re curious about understanding and read through the available information presented here. You might find yourself nodding your head and getting a better understanding of that person. The beginning of the year is well-represented by the handsome and memorable garnet stone. Being positioned so near the new lunar cycle makes it a stone that is symbolic of travel and movement. Those born in this month often move a great deal in life and experience many joyous and wondrous things. Garnet matches them well and it is perfect for those who need to travel. 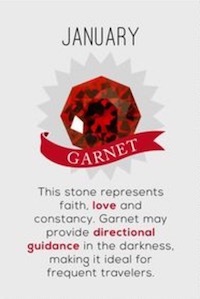 Garnet comes in many different colors, including purple, red, and yellowish-green. 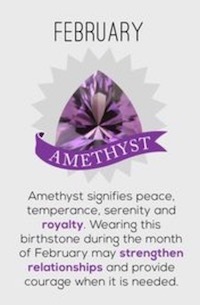 Purple birthstones represent a great burst of life and a heavy emotional investment. Red is a vibrant and exciting color that indicates a person who is fully of energy and life. Yellow-green is more Earth-bound and is perfect for someone who is reliable and steady. February is often a very cold and bitter month, one that requires great personal fortitude to get through every year. People born in this month are represented by amethyst, a sober and serious purple stone that fits them well. It is symbolic of courage and strong relationships – people born in this month are loyal to their loved ones to the bitter end. Purple is a very royal color and this stone was once limited to those in seats of power. As a result, those born in February often have a regal bearing that matches their stone. They are very respected and sometimes serious people, though not without a sense of fun that matches their light-purple birthstone. Rebirth and the beginning of new life are hallmarks of this month. However it is one that is often very unpredictable – calm moments of warmth are contrasted with heavy moments of winter distress. As a result, those born in this month are blessed with aquamarine, a light green birthstone that is connected with healing and the soothing powers of the ocean. In the past, it was used to cure heart, liver, and stomach diseases – just soak the stone in water and drink the water to get the benefits. It is reflective of the turbulent waters of the ocean, well representing the sometimes virulent and exciting personality of those born in March. Those born in April are soaked in the promise of sunshine and in the rebirth of the world. They are often showered with love and affection and grow up to be pleasant and wonderful adults. 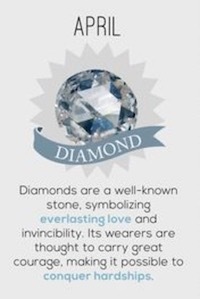 Their birthstone, the diamond, perfectly matches their personality. As a clear or white symbol of everlasting love, it shows the true value of those born in April. Diamonds have been highly valued for millennium and are often connected heavily with courage, beauty, and royalty. In the Hindu mythology, they are heavily connected with gods and kings. Those born in April, therefore, are often people of authority or those in control of a situation. The rebirth that begins in April reaches its fullest flowering in May. The rich green of its emerald birthstone is symbolic of the flowering of the world. Connected heavily to Venus in ancient Roman times, love, beauty, and wisdom are heavily connected with this stone and those born in this month. Expect those born in May to show a lot of patience to those around them and to be surprisingly insightful in difficult situations. Turn to those with the emerald birthstone in times of crisis and when you need a friend who will stand tall beside you in tough times. When you say someone is as “precious as a pearl” you are indicating their unique personality, which is as hard to find as a pearl. Those born in June are connected with this birthstone, which has long been a symbol of purity. 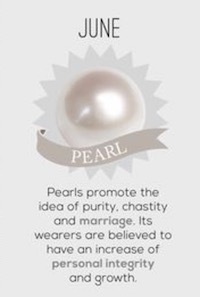 The pure white colors of each pearl show a sense of innocence and love that was connected to various goddesses of love in the past, particularly Aphrodite. As a result, many in June have a sense of wonder and light about them. Like the warm and pleasant month in which they were born, they have a simplicity that belies a deeper understanding of the world and which makes them transfixing and wonderful to know. When somebody wants to talk about heat, they always compare something to July. The peak month of the summer, it is associated with warmth, happiness, family, and the swing from the beginning of the year towards the end. In the Hindu religion, it was called the “king of gems” and was renowned for its gorgeous deep red colors. 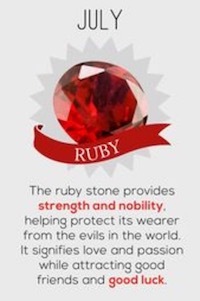 A protector from evil, the ruby signifies love and passion and shows off the fiery temperament of those born in this month. Temperamental, but exciting and passionate about what they love, those born in July can be a whirlwind of a person to know. But they’ll never be called boring. August often represents the strongest and most reliable months. The weather is warm, the trees are strong, the crops are at their peak, and the world is comfortable and happy. 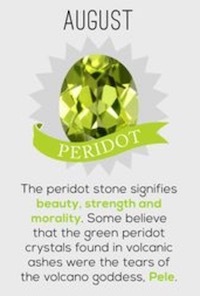 It’s birthstone, peridot, is representative of this strength. It’s light green color is a perfect pairing with the long evenings of August and the fun of sitting outside and contemplating the world. Connecting with volcanoes for centuries, it often represents a person who has a similar volcanic personality. Those born in this month often overwhelm those around them with affection and an outpouring of emotion. Strap yourself in and just go along for the ride. 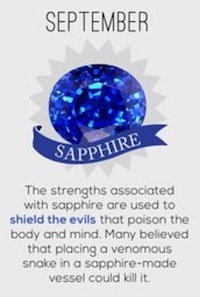 Sapphire is a deep blue birthstone that is connected to the idea of guarding against evil and the problems associated with poisoning. Wisdom and purity is also connected to those stone and it has been used to ward off bad influences for generations. Its color is symbolic of the waning months of the year – there’s only three more after this one. September is often a month of winding down and preparing for the long winter time. Crops will be picked and heat bills will rise. Those born in September often have a similar personality, but one that matches the deep blue of their birthstone. Most are practical, thoughtful, and hardworking. Quite a contrast to the wildness of the summer stones. Opals come in many different colors, which symbolizes the somewhat uncertain nature of October as a month. Some Octobers will be warm and pleasant: others will bring in winter and cold weather. Harvest times are often connected with this month, as are the frightful connections with Samhain and Halloween. 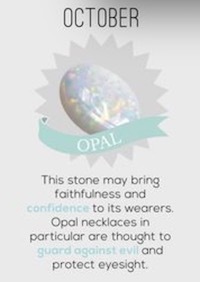 The opal, therefore, is designed to protect those born in this month from evil or difficult moments. Those born in this month are often somewhat similar to those born in September, but they have a more spiritual and searching side that makes them roam further from their home. November is a month of shutting down and preparing for the lengthy deep freeze of winter. That doesn’t mean, however, that November is a cold and loveless month. 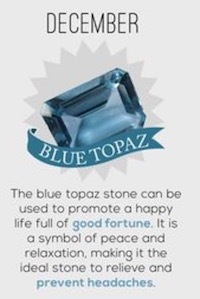 In fact, its birthstone, topaz, is one of the strongest symbols of love and affection. Spending time with family and relaxing indoors is a major part of the November months. Those born in this month are connected to their yellow stone by their endless love, boundless enthusiasm, and great personal strength and intellect. No matter what life throws at them, they bounce back from it with a smile on their face. December is the end of the year and a time of great joy and bitter sorrows. The holiday seasons are bunched here as a way to celebrate a long and eventful year. Love and happiness is in the air, but many people do not make it through this month, giving it a tinge of sorrow. Turquoise, a light blue gem, matches this month well. It is a love charm that is symbolic of positive success and relaxation. Those born in this month often achieve great levels of success or have ambitions to try new things or go places that have never been visited. Travel is huge for them. 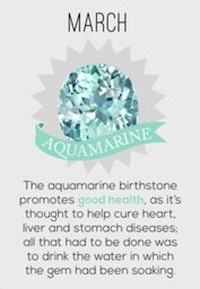 Did you see yourself in your birthstone or did you think it was a little off? 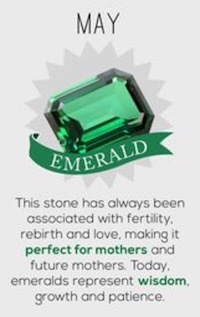 Chances are you probably saw quite a bit of your personality in your birth month and birthstone. Life takes us to many wonderful and magical places and our birthstones can help guide us to all our destinations.